New Paint Scheme for F-5? These two F-5E at CCK AFB have adopted IDF’s paint scheme on their nose sections. 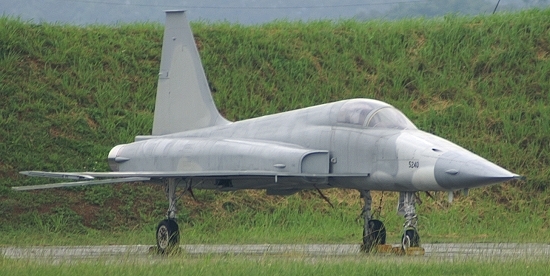 So is ROCAF unifying the paint scheme for its fighters? A closer look reveals that they are in fact decommissioned aircraft. The air intakes were sealed and wheel doors removed. They are used as IDF decoy, which explains why they were painted this way. Leading edge root extensions were also added to make them look more like real IDF. It is too bad some of us can’t keep our mouth shut. The deception might have worked and probably would have saved a real IDF or at least make the enemy waste some of their ammunitions on the decoy. When does our individual responsibility for our national security rise about our own vanity to be the first to report something? No real F-16, IDF or Mirage 2000-5 will caught dead outside of their HAS, or caves, or whatever. Everybody knows that……. It is sad that in the 21st century some people still equate decoys with national security. The photos were taken at the CCK Openhouse, attended by hundreds, if not thousands, of people. If publication of such photos was a breach of national security, then the openhouse should not be held at all in the first place and all the officiers responsibile for arranging the openhouse should be jailed. If you have a few minutes to spare, please go to http://maps.google.com and enjoy the air base “openhouse” there.